Well-written memoirs take readers out of their lives and into another person’s world, offering a variety of experiences and insights along with the rare opportunity to walk a few miles in someone else’s shoes. During Mary Albanese’s adventure-filled life, she hiked some of the starkest, most desolate, yet wildly beautiful terrain on the planet, the far north country of Alaska—the region of the Arctic Circle. 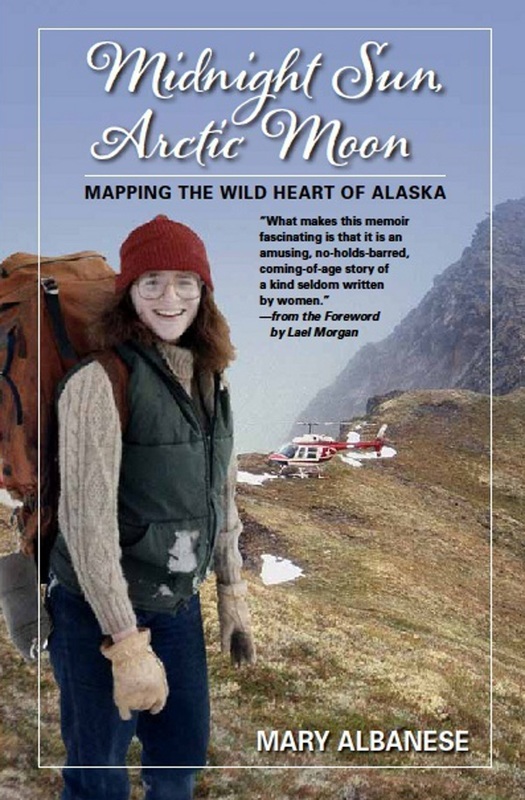 In her memoir, Midnight Son, Arctic Moon: Mapping the Wild Heart of Alaska, Mary Albanese chronicles her life’s journey as she explores and maps the beautiful world of extremes that is Alaska. As many of us do, Albanese stumbled onto her career path through a series of seemingly chance remarks and encounters. Or was it destiny that guided her to the path less traveled? In college, she studied earth science, fascinated by the planet’s secrets and exploring the giant puzzle of rock. Then she added a program in environmental studies and also took classes in drawing and painting. She graduated in 1977 with a fine arts degree and two degrees in science. For no apparent reason, while still a college student in Long Island, New York, Albanese set her sights on Alaska. The desire became a compulsion long before the petite, young woman bought a one-way airline ticket to Fairbanks with every intention of getting her master’s degree and becoming a teacher. At the time, there was a severe shortage of educators in the state. She had been turned down by every school district in Alaska, but didn’t let it stop her when she found out why. It seems that New Yorkers had a bad reputation in Alaska—those hired never showed up. But if she were a resident with a master’s degree in teaching, Albanese reasoned, it would be a different story. Since it was offered, and in spite of the fact that she wasn’t particularly qualified for an advanced geology-research program, she thought it wouldn’t hurt to apply for that, too, and to her surprise, she had been accepted. On the day she was planning to let the geology department know she wasn’t interested in the program, fate intervened. She had been invited on a summer geology field trip to an area in the far north. During a brief conversation in a hallway with one of her professors, he revealed his unfulfilled longing to go there. It was a life-changing moment when Albanese awakened to her dream and realized she wanted to be a geologist, not a teacher. But it wasn’t going to be easy, the male-dominated field demanded strength and physical endurance, plus she would have to be tougher, smarter, and willing to work twice as hard. Albanese was up to the task. In addition to a career and a land she loved, she also found her husband, Tom Albanese. The Alaskans have a saying about their men, “The odds are good, but the goods are odd.” Fortunately, Tom was from the lower 48, and they are still married. It’s not necessary to know or care about geology to enjoy Albanese’s story. She manages to capture the essence of a place, a time and a people during some rarely recorded moments in Alaska’s history. Her writing clearly conveys a wide range of human dramas made even more difficult by the often harsh and hostile environment of a land known for its hardship and depravation. Midnight Sun, Artic Moonis an intriguing, entertaining, and informative story seasoned with a dash of humor by a talented writer who has carefully honed her skills. On the subject of writing, Albanese says, “It defines each one as unique, yielding a fingerprint of the soul and explaining why each of us matters.” Her story and the people of Alaska will linger in the reader’s mind long after the last page is read and the book is closed.